Wait a minute, I feel like writing again. Better seize the moment while it lasts. 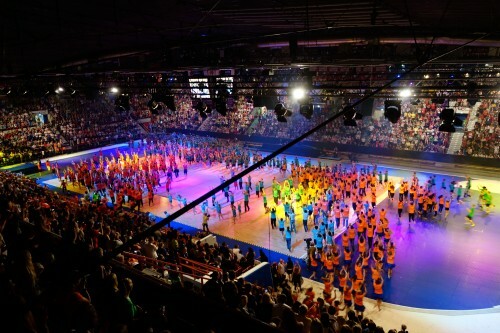 This week was a very special week for Helsinki, as a gymnastics festival called Gymnaestrada took over the city. I knew that it was coming for a few years in advance, but I didn’t really pay attention to it as gymnastics wasn’t really my thing, even bearing the fact it was going to be one of the biggest events ever held in Helsinki. One of the outdoor stage’s audience seats were the Senate Square’s stairs. But when the festival finally started with around 21,000 excited participants from all ages flooding the streets and public transports, it was impossible for me not to get curious what it was really all about. It turned out to be something very cool. 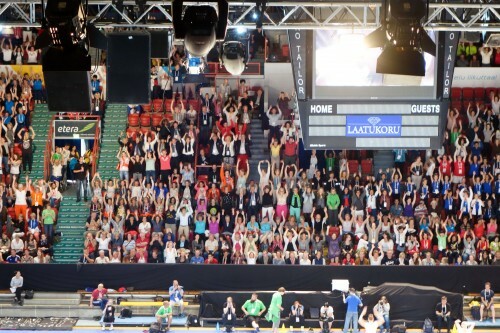 One of the core aspects of Gymnaestrada is that although most of the visitors from all over the world do also perform, there isn’t any competition going on. Everybody just does it for the pleasure of showing their hard trained performances to an audience and getting together (and to see the city itself too, of course). I went to see some free outdoor performances during the first days and was so impressed by the talent and positive vibe that I decided to buy a ticket to one of the indoor performances (the one in question was presented by Japan). The audience (some of them participants themselves) didn’t hesitate in joining in the festival’s official dance moves to warm things up. There were performances from all ages. This Japanese group was probably around five years in age, but were full of enthusiasm. The Japanese show was great, ranging from elegant choreography to sheer energy of dancing and the festive atmosphere was so contagious that I decided to buy a seat for the FIG Gala, which promised to have even more skilled performances from different countries. 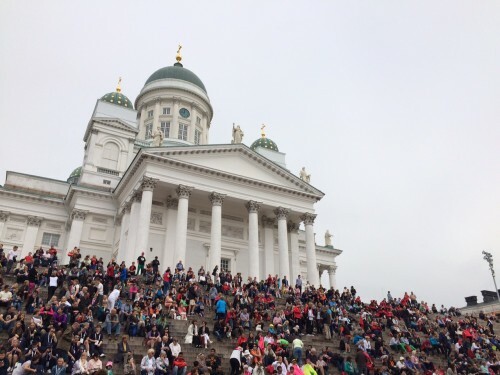 It turned out to be just that and again I enjoyed how the everybody was enjoying their time in Helsinki together as one with no competitive pressure. The FIG Gala was over and the performers packed up to celebrate with the audience for a good show. I went to the closing ceremony too, which was a somewhat mellower affair, but I have to say the whole festival – even as a mere spectator with no ties to gymnastics – left a big impression in me. Sure, this was no World Cup, Champions League or Olympics. But then again there are no losers or in worst case scenarios, negative rivalry between nations. Gymnaestrada showcased what a sporting event can be at its best even with not so stellar high cost venues and expenses that seem to plague many other major sporting events these days. It felt like a back-to-basics celebration of the human body. Maybe the most positive thing for me was that after looking at all those energetic performances from all ages and continents, it encouraged me even more to consider other forms of exercise. My current hobbies – running and casual yoga – are fine, but not exactly oozing with fun. I realized that I haven’t made the most out of my own body in that sense. I guess that was the secret objective of the festival all along. To inspire people to move. My thanks to everyone involved for reminding me about that.